Some patients struggle with mobility and transferring themselves in and out of a bed can be a difficult challenge. Rather than lose independence though, an aid can be used to help steady them as they move, assisting with balance and support. 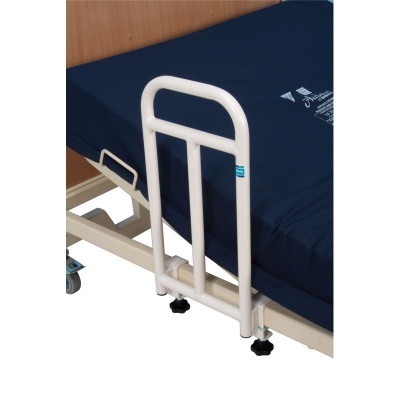 The Sidhil Elland Bradshaw Bariatric Bed Grab Handle is ideal, as it attaches securely to the framework of the Sidhil Bradshaw Bariatric Low Nursing Care Bed and offers stability during transfers to increase patient independence and reduce carer handling time. This Bariatric Grab Handle is simple to attach to the framework of your bed, and can be installed without any tools. It can be clamped onto the bed in seconds and tightened using the hand wheels, providing greater patience independence with little effort by the carer. Please be advised that the Sidhil Elland Bradshaw Bariatric Bed Grab Handle is usually delivered within 1 week of your order being placed. We would advise you to consider this delivery estimation before placing your order. For more information, please contact our Customer Care Team at 020 7501 0592.